This blog article marks the first post in our Exceptional People, Exceptional Results Series, where we’ll be highlighting team members and their trades. Our goal is to give customers an inside look at how our team sets GSM Industrial apart. This series starts with a focus on Fabrication and one of our exceptional Fabricators, Hunter Mayfield. GSM Industrial delivers Custom Metal Fabrication Solutions along with quality, value, and reliable performance. We have the unique ability to work through your entire project, from problem-solving & design through installation. We work with many types of metals including Carbon Steel, Stainless Steel, Aluminum, Hastelloy, AR Plate, and Hexmesh. We can fabricate plate, angle, beams, I-beams, tube steel, and more. Our shop includes a designated fabrication bay that houses 2 CNC plasma cutters, an assortment of heavy shears, press brakes, rolls, and structural steel drilling, cutting, coping, and angle-rolling. Our latest fabrication equipment additions include a Davi Roller, which has a plate steel max thickness of 1” x 10’ wide, a Messer Plasma Table, with a plate steel max thickness of 1-½” and a bed of 96” x 35’, and our Ocean Clipper CNC Angle Line. 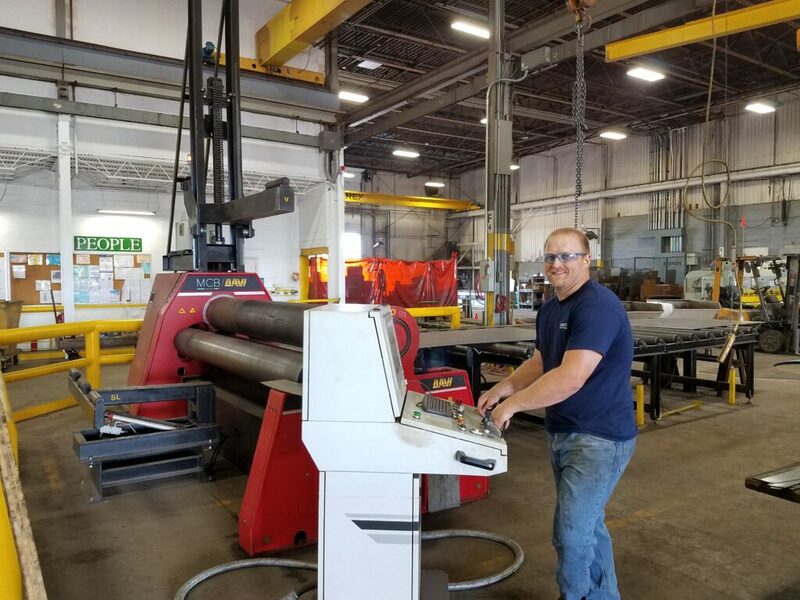 Throughout the years, we’ve been able to significantly reinvest into the company by acquiring the equipment items that allow us to perform more of the fabrication in-house instead of outsourcing like many other custom metal shops. It also keeps us competitive and gives us the ability to control on-time delivery. While a welder is responsible for fitting one piece to another and fusing them together, a Fabricator is responsible for visualizing, mapping out, and making sure that each component of a project comes together to maximize the performance and overall efficiency. At GSM Industrial, our Fabricators are among the best in their field at this process. Our team includes 11 Fabricators with an average of 16 years experience. So Hunter, how long have you been a fabricator? I have been at it for over 12 years now. Has that entire time been with GSM Industrial? Yes. I was hired by GSM Industrial right after high school. I’ve been with them since. I learned by getting my hands dirty with on the job training at GSM Industrial. What do you feel differentiates an exceptional fabricator from the rest of the pack? The ability to overcome problems and mistakes through out the entire job. Also I would say you have to have the willingness to perform any task necessary to get the job done. What do you like most about Metal Fabrication? I like working with my hands. I also like having a new job opportunity come by that challenges my abilities and pushes me to the next level. Do you have a favorite project type? Heavier material jobs, ductwork, and rolling larger items. What type of material do you fabricate? Hot Roll Steel, Stainless, Aluminum, Galvanized. Material sizes anywhere from 2’’ to 40’ plus. What do you feel best differentiates GSM Industrial from the Competition? We do the projects that no one else will do at a level they can’t do. We’ll do the tough and challenging projects. And we deliver very high quality. With employees like Hunter Mayfield on our team, we can truly say that we are exceptional people, delivering exceptional results. Our Fabrication capabilities, experience, and team members are what set Custom Fabrication Solutions from GSM Industrial apart from the competition. If you haven’t seen our Exceptional People Video, check it out. Have a question about our Custom Fabrication? Contact us today to learn how we can help accomplish your next project. Don’t forget to check back soon for our next blog post in our Exceptional People, Exceptional Results Series.